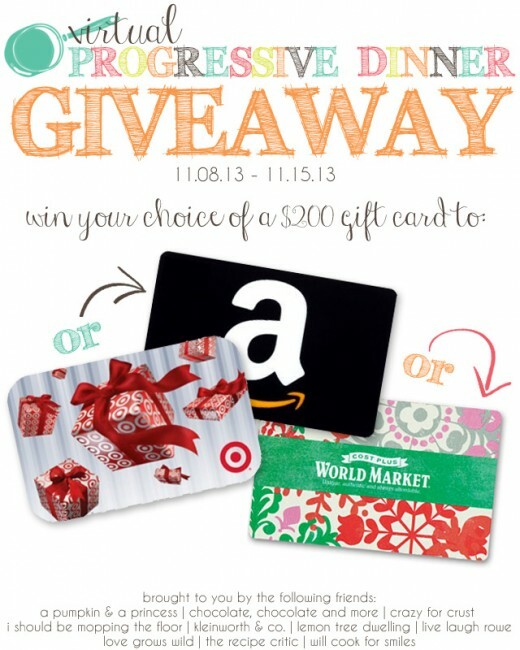 Serve your guest something amazing during these holiday parties! This Maple Cranberry Baked Brie is so delicious, your guests will go ga-ga over it and they will never know just how easy it was to make! I got together with some amazing ladies to bring you this delicious dinner! It is a progressive dinner, which means that you should move from one site to another to see all the dished that are served at out dinner! We have two drink recipes, two appetizer recipes, two main dish recipes, three side dishes and two desserts…all for you!! I’m not finished ….we have a GIVEAWAY for you!! Keep reading! To rind or not to rind! Meaning, rind on or off? It really is a personal preference and mostly depends on the quality of the cheese. On a nice Brie, the rind can be quite good and a nice flavor addition. Although, if you the cheese is not the best quality, the rind will be awful! 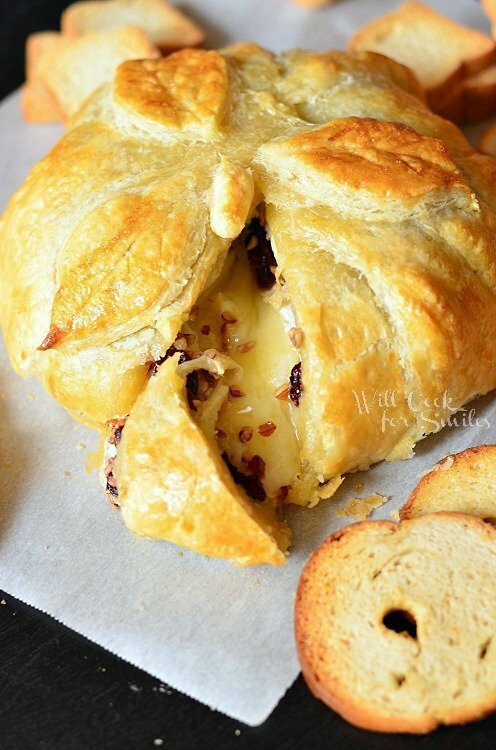 So when making this baked brie appetizer, know your cheese. If you have a favorite brand, you will know if you want to keep the rind of take it off. If you are planning on taking off the rind, refrigerate the cheese and make sure it’s nice and cold before you are cutting. It will be much easier to take off the rind off of cold cheese. 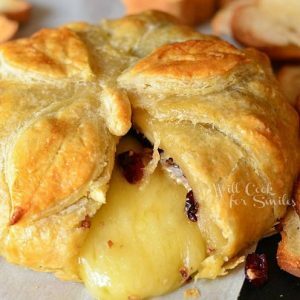 This Maple Cranberry Baked Brie is so delicious, your guests will go ga-ga over it and they will never know just how easy it was to make! *You can either use both puff pastries in the package, one for wrapping the Brie and part of the other for the leaves. If you only want to use one sheet of puff pastry, cut off a thin slice to use for leaves. Mix pecans, cranberries and maple syrup. Lay out the sheet of puff pastry. Place half of nut/cranberry mixture in the center and spread it in a circle the same size as the Brie. Place the Brie over the mixture and cover it with the rest of the nut/cranberry mixture. Bring the edges of the pastry up, a little piece at a time, overlapping. Bring the edges together at the top and press together to seal. Cut the leaves out of separate piece of pastry and add them to the top. Whisk the egg and brush the pastry covered brie all over the top and sides. Place the Brie on the parchment paper, on a cookie sheet and bake for 15-20 minutes (until the pastry is golden brown). Now, visit these wonderful blogger to check out the rest of the dinner!! Some great tasts come together for something special! Lyuba, Great progressive party! Love all the courses!! This would be perfect as part of a Thanksgiving Day spread! I am SO drooling Lyuba. This is fantastic. I could LIVE on brie! I’m a new reader to your blog and just wanted to tell you how very much I’ve enjoyed reading it. The progressive dinner is pure heaven! I love a party and your choice of fellow bloggers was great. Thanks for all the hard work. You are so sweet, Suzie! Welcome! I saw this on Instagram and had to come and see it ASAP! LOOKS SO GOOD! You’re making me blush, Kristi! Thank you!! 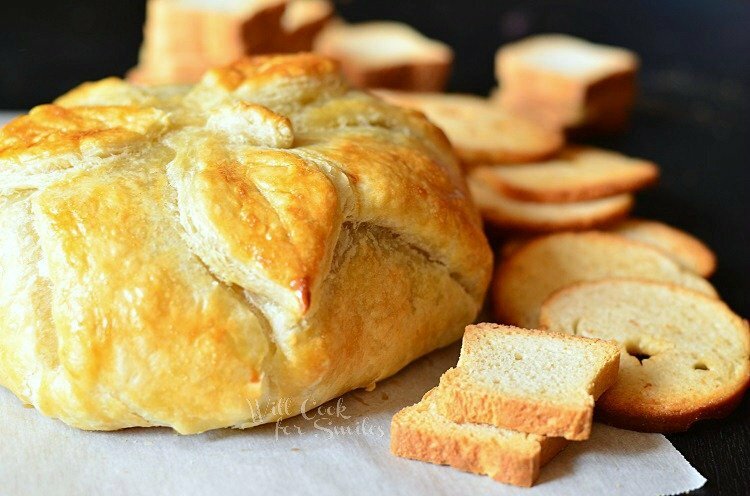 I am such a huge fan of baked brie, Lyuba….and I love this variation! Can’t wait to try it out for the holidays!! 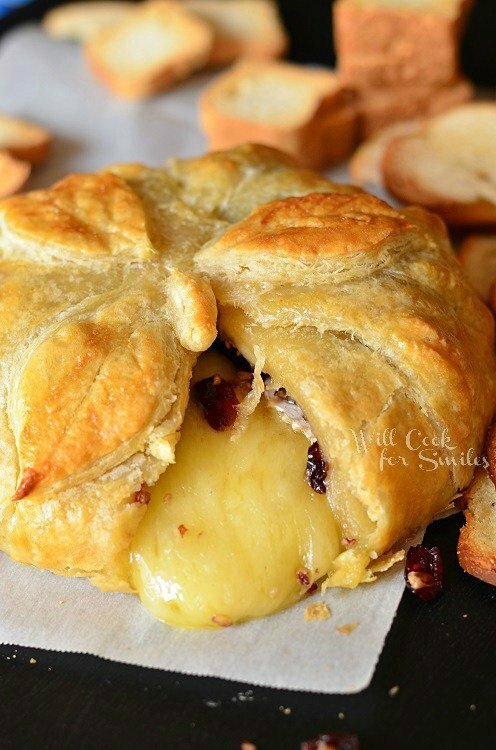 I love baked brie, especially around the holidays! The cranberry maple version sounds perfect! I love most anything made with brie and your recipe sounds easy to fix and perfect for Thanksgiving. Lyuba, I can’t even begin to tell you how much I adore baked Brie! I just love the flavor combination on this one and your pastry is gorgeous! Awww, thank you so much, Joan! Thank you for your comment and compliment! This looks amazing. Thanks for sharing at the linky party and I also shared on my Facebook page! Of course, Alexis! Thank you! I am so happy I found you and your site. 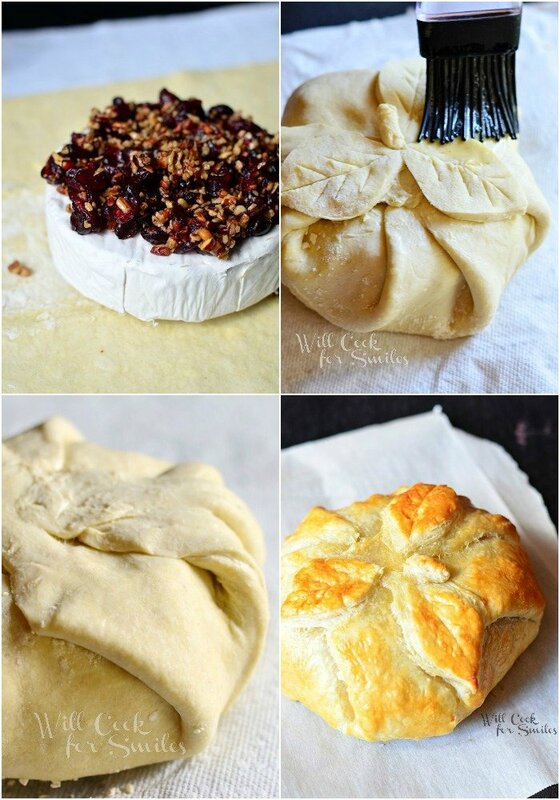 I have always wanted to try baked brie but didn’t know how. Now I have the confidence to give it a try. Thank you. I have signed up to receive emails. Awww, thank you, Susan! It is so easy, don’t be scared! Thank you! This looks so yummy! 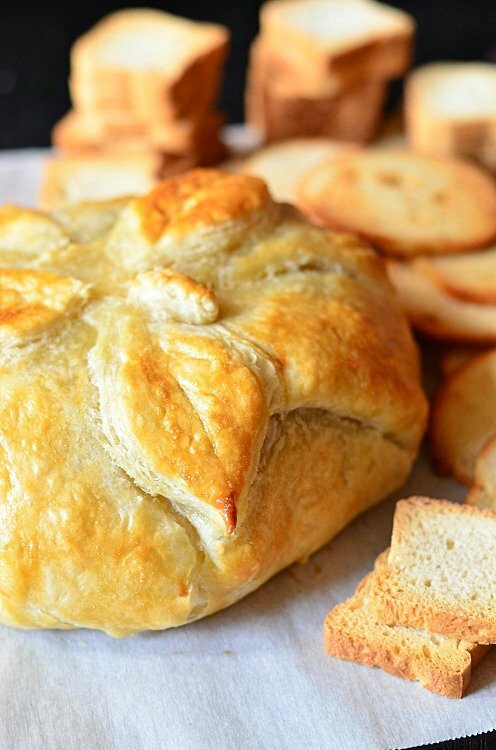 I love brie and it especially looks delicious paired with puffy pastry! It sure it, Kristen! Thank you! Wow these look incredible! I’d love to have you come link your post up the weekend re-Treat link party that ends tonight – http://www.playpartypin.com/2013/11/weekend-re-treat-link-party-43.html. This is an 8 oz brie roll, wrapped in a sheet of puff pastry. It’s a pretty good size and can safely serve 6-8 people, depending on how much they will eat.